As athletes we engage with the larger sports community through a variety of events each year. We believe that this is important to support important international, national, and local efforts to develop sport with positive values as an important part of our society and of the experience of our members. Olympic Day is an annual international event, supported by the International Olympic Committee and the United States Olympic Committee. This year we will host a National Training Program Moniteur 2 Clinic on 25 June as our registered Olympic Day activity to help train a new generation of entry level coaches who can develop beginning and intermediate fencers. More and better coaches mean more and better fencers, increasing the pool of athletes who compete in our sport and building support for the sport and its traditional values of courtesy and good sportsmanship, ethical conduct as coaches and athletes, and respect for other athletes regardless of their nation or club, gender, race, religion, or beliefs. If you are interested in learning to coach, watch for announcement of the Moniteur 1 Clinic in May and this Olympic Day Clinic in June and sign-up on FRED. Each year the Women in Sports Foundation, National Women’s Law Center, Presidents Council on Fitness, Sports, and Nutrition, and Girls, Inc. sponsor National Girls and Women in Sports Day in February to promote the role of girls and women in sports. This year on 3 February Salle Green dedicated a special issue of our newsletter Thrust and Cut to the history of women in fencing, held discussions on the role of women in fencing in all of our classes, and gave special recognition to our female fencers. The International Day of Sport for Development and Peace in April is a project of the United Nations to empower sport to contribute to the achievement of the Millennium Development Goals and to underline the way in which sports foster peace and contribute to an atmosphere of tolerance and understanding. In 2015 the Federation Internationale d’Escrime (International Fencing Federation) called for fencers worldwide to rally around the white card as a symbol of commitment to support these goals. 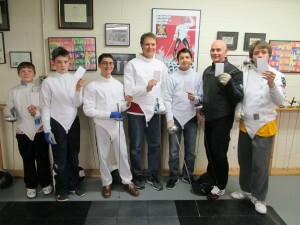 On 6 April our fencers embraced that call and held up their White Cards. This is particularly symbolic for fencing and the many international sports that penalize infractions of the rules with yellow, red, and black cards. Each year in September fencers worldwide are encouraged to participate in Fencing Flashmob to promote the sport. Originally developed by the Italian Fencing Federation, the worldwide Fencing Flashmob is now promoted by USA Fencing and the Federation Internationale d’Escrime. 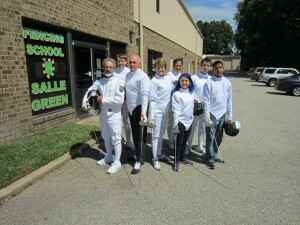 On 7 September 2015, our fencers conducted the only Fencing Flashmob in the greater Richmond area at Tilly Plaza on US Route 1 in Hanover County.